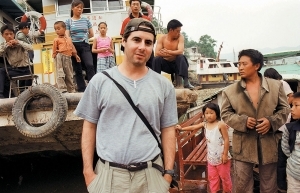 Peter Hessler with the Huangs, a local fishing family described in his 2003 New Yorker essay ‘Underwater,’ on the rising waters of the Yangtze River shortly after the gates of the Three Gorges Dam were closed, Wushan, June 2003. This piece was first published in the May 7, 2015 issue of The New York Review of Books. But this evening, Liu was just a foil for the other writer: Peter Hessler, a low-key New Yorker journalist. Based in China until 2007, he later wrote on the American West and now lives in Egypt. Hessler has written three books on China and a collection of essays, all published in the U.S., and been recognized with a MacArthur fellowship. In China, however, he has been transformed into a writer of cult-figure proportions whose fans analyze his love life, his translator’s finances, and his children’s education. An enthusiast has written a book imitating his prose style and retracing his career, while a men’s fashion magazine flew a team from London to his summer home in Colorado to shoot a three-page photo spread. China has had celebrity authors before, but never a foreigner who writes on its most sensitive subject: itself. I’ve known Hessler for fifteen years, but sat somewhat befuddled in the audience. As much as I enjoy his work, I couldn’t help wondering why people in the audience seemed so impressed when he said his daughters were learning Arabic (not Chinese! ), or clasped each other when he said he hoped to return to China one day (what mysteries about us will he unveil?). Organizers had asked people to register for the event ahead of time, and more than one thousand signed up for the three hundred seats. People stood in the back of the room holding copies of his books, or milled around in the hallway hoping to catch a few words. Suddenly the evening began to have something rare in this staid city of twenty-odd million: the electricity of a genuine public event. The authorities had done their best to prevent this. The talk was supposed to have been held at a nearby university, but administrators there had canceled at the last minute after receiving instructions that they weren’t supposed to hold public events, especially one involving a liberal intellectual like Liu. As China’s ideological atmosphere has tightened recently, she has curtailed her blog and seldom appears in public. Liu seemed eager to make the most of this rare public forum. She pointedly discussed many of China’s most sensitive issues: the democracy movement in Hong Kong, the Communist Party’s recent decision to abolish the notorious system of reform through labor, and the closing down of a network of rural libraries suspected of promoting civil liberties. “Are we touching on a sensitive issue now?” she joked with the audience, both knowing that they were, and that it was verboten. Hessler, by contrast, kept to his writing persona: the wry observer who in his works on China has taken such a broad view that daily politics rarely enter his work. He talked largely about working in Egypt—the importance of Cairo versus the relative unimportance of Beijing, for example, or why the Egyptian revolution failed. When China came up, he spoke in fairly optimistic terms that complimented his audience of young, white-collar workers. They nodded and applauded when he said they were a generation of individualists, with their own ideas and thoughts. The last questioner before the evening ended, though, had been slightly irritated by Hessler’s neutrality. She was a young woman in a knit dress, and she stuttered as she tried to make her point: Shouldn’t his writings be more than a description—shouldn’t he try to help people? One of the most vexing questions for a writer on China is how best to capture the drama of its transformation. Twenty years ago, I joined a government-sponsored reporting trip to a remote, impoverished part of the country. A low-level official and I chatted for hours as our small bus wound through the mountains of Guizhou in south-central China, speeding through long tunnels and over suspension bridges. Why, he asked me, do foreign correspondents only write about the bridge that collapses and not the thousands of bridges that don’t? I thought he was joking, but as we talked I realized he meant it seriously: countless studies show that one of the best measures to alleviate poverty is building infrastructure, and here we were on a road that was something of a miracle to local people, allowing them to get their products to market, their children to schools, and themselves to jobs in the cities. China was in the midst of an unparalleled and largely successful attempt to reduce poverty, so why wouldn’t we write about this, he asked. All I could do was stammer that good news is no news. Back in Beijing a few days later, I wrote a story about a girl who was so poor she lived in a pig stall. My editors loved it and readers pledged money, but I was often nagged by the feeling that this had been the easy story. More challenging to expectations would have been to look at how lives had changed in this poor part of the country. The answer is partly that reporters in free societies have an obligation to dissect problems. Journalists at home rarely write about the highways that work because this is assumed to be a given; what citizens need to know about is the backlog of unrepaired bridges. But when applied abroad, this practice means a steady stream of negative stories with no overall sense of the broad situation of the country—in the case of China, reports of dissidents, internecine contests for power, and impending crises. Certainly the repression of dissidents must be known; and some positive stories do appear, for example, about the high-speed rail system or growing wealth. But even so, many are framed as negative stories: high-speed rail tickets are too expensive for the poor, or prosperity is conflated with a rising class of boorish and corrupt nouveaux riches. It may be that journalism is not the best medium for conveying the broadest social trends, but we still don’t often hear about the quiet emergence of a true middle class of shopkeepers and tradespeople, or an internationally engaged, book-reading public eager to hear from the outside world. Hessler’s work challenges traditional coverage of China. I met him in 1999, when I hired him to be a researcher in the Beijing bureau of The Wall Street Journal. By then he had already spent two years in the small Chinese city of Fuling as an English instructor at a teachers’ college. He was living at home in Columbia, Missouri, having just completed the manuscript for River Town: Two Years on the Yangtze, but wanted to return to China to keep writing. I was impressed that he had experience in a fairly remote part of China and offered him a job over the phone. In person, he is more pointed in arguing his ideas and stubborn in defending them. By 2000, at age thirty-one, he was writing regularly for The New Yorker but his articles were not his predominant concern. Instead, he pursued book projects and carved articles out of them for the magazine—as opposed to the usual practice of magazine writers who produce articles and cobble them together into books. For him, his larger understanding of China came first, the journalism second. Hessler saw the story of China in the 1990s and 2000s as driven not by nationally known personalities or dramatic news events, but by an epochal movement of hundreds of millions of people out of poverty, and out of the village life that had dominated Chinese civilization. It was the rise of individuals—people with their own aspirations and goals, which they pursued in the space granted by the post-Mao state. Hessler lived in China while people like future Nobel laureate Liu Xiaobo were publicly active, but he never wrote about them. To him, they might be noble but were marginal. That they were persecuted proved the state’s paranoia, not their larger significance for China’s future. Hessler in Wushan, June 2003. During his tour, I had the chance to talk to him at some length, and he emphasized to me that he isn’t allergic to politics. In Egypt, he has written extensively about the Muslim Brotherhood and attended former president Mohamed Morsi’s trial. In China his books include an in-depth look at the Party’s operation in a village and sensitive issues such as hiring underage workers. But in China, he said, he felt that elite politics are less important, especially when they revolve around classic dissidents challenging the state. During his eleven years in China, Hessler said he had been entrenched in a community three times—the teachers college (two years), a village (seven years), and a company town (three years)—and could follow events there longitudinally. In each place, the same pattern emerged: the most talented people either were recruited by the Party or quietly disengaged from it. The only people who actually fought the Party were “poorly connected and often dysfunctional”—petitioners, for example, or other marginal figures. Many were interesting and he wrote about them in depth, but they were not driving events. These strongly held ideas underpin his books. Many journalists in China have been turned off—I often heard them say they wished he would finally tackle a “real” topic rather than his allegorical tales from small towns. But readers seem to find something of value. According to royalty statements at the end of last June, Hessler’s four books have sold 385,000 copies in the U.S., a figure that easily makes him the most influential popular writer on China in decades. Many readers realize intuitively that if China were a country primarily defined by the troubles reported in the media, it would be a basket case. Yet this doesn’t match the rising power they know from their shopping malls or workplaces. Hessler’s portraits help explain a rising China, and do so through gentle and often optimistic stories that parallel myths familiar to Americans—Horatio Alger–type tales of people on the move. Not too long after he became a fixture in The New Yorker, Hessler’s stories began attracting Chinese readers, too, thanks to the Chinese translation website Yeeyan. Readers were stunned that a foreigner was interested in ordinary people. China has little tradition of narrative nonfiction. The few books that deal with daily life, such as the sociologist Liang Hong’s study of her home village, Liang Village in China, have sold well, but they are rare and most are poorly written. It is tempting to accept censorship as a matter of the margins—a pruning that leaves the core of the story intact—but altering the proportions of a portrait of China gives a false reflection of how China appears to the world at a moment when it is making fundamental choices about what kind of country it will become. Recently, the well-known Chinese historian Joseph Esherick joined the debate, taking the opposite tack. In an essay on the ChinaFile website, Esherick explained how censors demanded significant changes to his recent book about a famous family in Chinese history. He described how he successfully argued with them on some points, but in the end agreed to cuts and alterations. The reason, he wrote, is because he believes that change in China will happen by “continuing a dialogue with Chinese colleagues, engaging the censors, and pushing the envelope to its greatest possible extent.”5 Hessler joined the debate himself in The New Yorker (“Travels with my Censor,” March 9, 2015), portraying book censorship in China as much lighter than many outsiders expect, and carried out by people who are often eager to circumvent restrictions. Like Esherick, Hessler agreed to trims. River Town seems to have suffered the least, with just a few references to Deng Xiaoping and the handover of Hong Kong in 1997 excised. I wondered, however, what the censors made of his most politically sensitive essay, a seventeen-page piece in the essay collection Strange Stones about the Party leadership’s retreat at the seaside resort of Beidaihe. I found that a half-dozen sentences had been cut in the Chinese edition, such as this one: “Communist China had never had an orderly succession—for half a century, every transfer of power had involved coups or power struggles.” I also found many smaller examples of the translator smoothing over phrases that might offend censors, substituting the word “location” for “battleground” in referring to the meeting at Beidaihe, or “chaos” instead of “crackdown” to describe the 1989 Tiananmen massacre. Hessler has recently put up a website with a Chinese-language page that lists the major cuts. He also got his Chinese publisher to include a short note at the start of new editions of his books directing them to this site. To date, the site has all the major cut passages from his three books published in China, but not the smaller word changes. How significant are these edits? The published account of the Beidaihe conclave loses the tension that Hessler originally intended when he portrayed it as a showdown between outgoing Communist Party boss Jiang Zemin and his successor, Hu Jintao. The sharp sentences making this point are expunged, blurring what was already an impressionistic essay. If Chinese readers were to think that this is all the West’s most influential writer on their country has to say on the subject, they would be misled. And yet the essay was probably intended not as a comprehensive account of leadership conclaves, but as a look at how ordinary people perceive elite politics. Hessler writes about arriving in Beidaihe and checking into a sanatorium, where most residents are old workers—the sort of people being crowded out of today’s Chinese society. He describes being followed by secret police, and talking to the old workers who know he’s being followed. They laugh at the cops, implicitly showing their solidarity with him. All of this is in the Chinese edition, with no changes. It’s not Hessler’s full account, but it’s still revealing of Chinese life in Hessler’s distinctive way. Is that good enough? These debates swirled through my head as I browsed the shelves of a bookstore in Beijing called One Way Street Space. It occupies part of a former government think tank, a three-story structure from the 1950s made of brick and covered in vines. The owners gutted the inside to expose the brick and concrete skeleton, and gave it a sleek finish of parquet floors, white bookcases, and spot lighting. I found titles that had been much discussed in China, such as The Dictator’s Handbook by Bruce Bueno de Mesquita and Paul Fussell’s Class, but wondered what was between the covers. This September, for six hours, One Way Street was given over to Hesslermania. In the afternoon, a dozen journalists badgered him for two hours on a strange variety of topics, from his views on genetically modified crops (he has no opinion) to whether his humorous story about a restaurant where rat was served was meant to show China in a bad light (it wasn’t—it was just a funny story he had sent his mentor, the author John McPhee, who recommended it to The New Yorker) and how his children are doing (fine). No one asked him what political ideas underlay his writings—why he didn’t write about dissidents, for example. When I asked the journalists about this later, they gave me the stock answer that Hessler was just an observer, faithfully recording what he saw. But the journalists were asking other questions as well. Most dealt with writing: what writers he was reading, how to use different voices, and to what extent true objectivity is possible. In one way, it was an odd exercise because none of the journalists later published stories on this question—most did fairly standard stories about the famous writer coming to town. It almost seemed sad—here they were, hoping to write great nonfiction, but would they have the chance? Still, it’s also true that technical questions can lead to broader lessons. I thought of a friend who recently lectured in a class run by a Chinese photographer famous for his pictures of pollution, but also known in photography circles for posing his subjects. He had told his students that this was okay, and so the students were stunned when the visitor said it was not—documenting reality requires a code of ethics. It isn’t substituting one form of propaganda for another. After the press conference and a hasty dinner, Hessler gave his familiar talk, in Chinese, to about one hundred readers crammed into the bookstore’s second-floor lecture hall. He described scenes from his childhood, when he got to know a friend of the family, the Chinese-American sociologist Peter Kong-Ming New. Hessler was named after the older man, and said he learned much of the craft of observation from him. The man also seemed extraordinarily tall and talkative. “I grew up thinking Chinese were giants who liked to tell stories,” Hessler said to much laughter. It was a shrewd topic because it made Hessler into a Westerner influenced by a Chinese scholar—a welcome reversal of roles for many who feel they are constantly being told to learn from the West, only to be lectured that they haven’t learned enough. It also reinforced the assertion that Hessler’s Chinese publishers promote: that at heart he is a social scientist looking at China, an objective observer with no agenda. I’d heard this from many readers, who seemed convinced that they were dealing with a scholar comparable, say, to Talcott Parsons, the prominent Harvard sociologist. The event ended and people lined up to get their books signed. Besides Hessler, I seemed to be the only other visible foreigner in the room and people soon surrounded me. “I’d like to hear more from him about politics. I feel we need to know more about Liu Xiaobo and Charter 08,” he said of the imprisoned dissident and his manifesto for political change.